Discover the meaning of life and understand the human quest for happiness in the truly engaging and entertaining documentary I AM, released in selected cinemas on 24th January courtesy of Omniverse Vision and available on DVD from 18th February 2012 courtesy of Universal Pictures International Entertainment (UPIE), the international home entertainment division of Universal Pictures. To celebrate the theatrical and DVD release Writer/Director Tom Shadyac (Ace Ventura: Pet Detective, Patch Adams, The Nutty Professor and Bruce Almighty) is taking part in a live interactive event on Thursday 24th January, taking to the stage to discuss with key influential speakers about their visions of the new world we should all strive for. The screening and dialogue will take place at at the Empire, Leicester Square, on Thursday 24th January from 7:15pm with a unique Q&A session afterwards and will be broadcast live into cinemas across Europe, with the opportunity for international audiences to interact in a live Twitter Q&A. The critically acclaimed and highly entertaining I AM tells the captivating tale of Shadyac’s pursuit for truth and after a bike accident left him with Post Concussion Syndrome. Debilitated by the effects of that accident and having stared death in the face, Shadyac sets out on a quest to answer two questions: what is wrong with the world and what can we do about it. Shadyac’s mesmerising documentary is a mix of interviews, animations and clips, featuring remarkable interviewees from the realms of science, philosophy and faith, including: Noam Chomsky, Archbishop Desmond Tutu, Coleman Barks, John Francis, Dean Radin, Daniel Quinn, Howard Zinn and David Suzuki, all of whom help sow the film’s thought-provoking, compelling fabric. 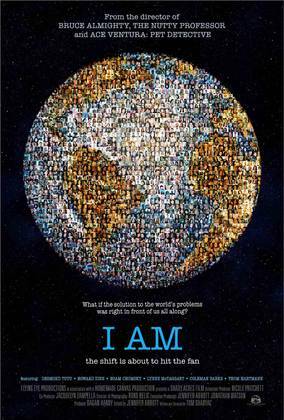 Delving into critical topics from human nature to our economy, I AM is a must-see documentary that instils a positive sense that change can be accomplished by simple acts on the individual level. Digging deeper than symptoms, Shadyac’s film magnifies the true cause of the world’s problems, and takes the audience on a journey of discovery leading us to the inspiring realisation that we all have the power to change the world. Panelist: Tony Hawks - best-selling author and comedian Tony Hawks will share his unique perspective on life and happiness. Tony will explain what he learnt about being happy from his infamous adventure hitch-hiking around Ireland with a fridge. He'll also share his views on generosity, the politics of happiness and why he's passionate that we should be putting people's wellbeing ahead of growing the economy at all costs. And of course he'll sprinkle in a good dose of randomness and fun along the way too. Panelist: Stephanie Crampin; Director of Communications for Giving What you Can, a charity whose aims are to encourage people to commit to long-term donation to good causes.